While acne may seem to be delegated to pubescent adolescence, the reality of the matter is that acne can actually continue to affect individuals well into adulthood. Moreover, like teenage breakouts, adult acne can affect one’s confidence and prevent them from being the best version of themselves. Like teenage acne, adult acne is skin condition that occurs as a result of either inflammation or clogged pores. However, there are a few contributing factors that can increase your risk of getting adult acne. Fluctuating hormones, be it as a result of menopause, menstrual cycles, stress or medication, can stimulate the skin’s oil glands and this then leads to an overproduction of sebum (skin’s oil). This can lead to breakouts around your chin and cheekbones. Adult acne can be a side effect of medication, a consequence of a diet rich in sugar and fats or the result of one’s exposure to pollutants in the air. If you’re struggling with acne, it’s always important to be conscious of ingredients used in your skin care products. The wrong ingredients will not only irritate the skin but they can block pores and encourage the overproduction of sebum. In fact, the wrong ingredients can also ignite hyper-pigmentation and scarring. Moreover, excessive use of skincare products can dry out the skin, which will only increase the risk of breakouts. When setting out to treat adult acne, it’s important to look out for specific ingredients that can help clear pores and combat inflammation. Salicylic acid is a great ingredient when it comes to dealing with acne as it both exfoliates and gently unclogs pores. Benzoyl peroxide is present in most spot treatments, as it exfoliates and kills acne bacteria. Sulfur is another ingredients present in spot treatments due to its ability to draw out excess oil from the skin. Glycolic acid is the go to ingredient when it comes to combating both acne and the tell-tale signs of aging. 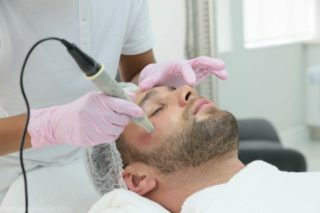 This acid works by removing dead skin cells on the surface which then reduces the appearance of both wrinkles and acne. Like glycolic acid, retinol (a vitamin A derivative) helps to both combat breakout and wrinkles due to it its exfoliating properties. 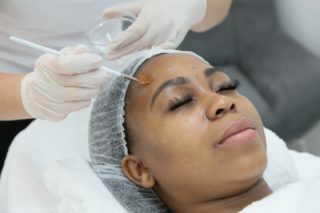 When it comes to the aesthetic treatment of adult acne, Dr. Portia Gumede, founder and medical aesthetic doctor at Dr. P Aesthetic Lifestyle Centre in Hyde Park, believes that as every patient is different, a thorough assessment is necessary before any sort of aesthetic treatment can commence. 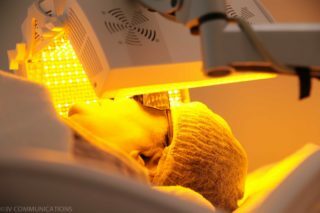 The assessment will help to provide a better understanding of the cause of the acne and as a result, they will better choose the best possible treatment plan for the patient. With regards to dealing with acne, many of us are likely to become frustrated with our breakouts and thus start to poke and prod at the pimples. This is an ill-advised move as these actions can lead to permanent scarring. Luckily, Dr. Gumede makes provisions for this by offering treatments that can help to ease the appearance of acne scarring, pigmentation and hyperpigmentation. Moreover, while she caters for all different skin tones and ethnic backgrounds, Dr. Gumede is also eager to educate darker skin-toned individuals on the best way to treat their acne. Through her over fifteen-year journey with aesthetics, Dr. Gumede has acknowledged how skin conditions and concerns can affects one’s confidence and self-esteem. As a result, she has set out to offer aesthetic treatments in hopes of encouraging one to become the best versions of themselves. Her treatments focus on the rejuvenation of skin and hair, so that patients can become more confident in both their skin and selves.